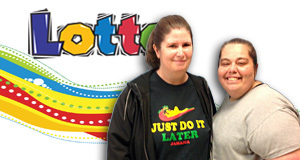 Congratulations to André LeBlanc and Maggie Galliano on their recent Lotto win! They won $3,325 by matching 5 out of 6 numbers during the March 13 drawing. "I was so excited, I started jumping up and down!" Maggie (right) explained. The winners are both employed at BJ's Country Stop #1 where the ticket was sold. "When we get tips, we usually buy Lotto tickets and happened to get a $1 tip that day," Maggie continued. The ticket purchased with their $1 tip won each of the Gray residents $1662! The winners plan to put her new dough into savings.